A new Orkney based business is sourcing and roasting high quality coffee beans from around the world, in the first commercial venture of its kind in the islands. The Orkney Roastery – set up by Sara Tait and Euan Smith – produces small batches of its own Aria brand coffees at its micro-roastery in Kirkwall for supply to shops, cafés, restaurants and hotels. 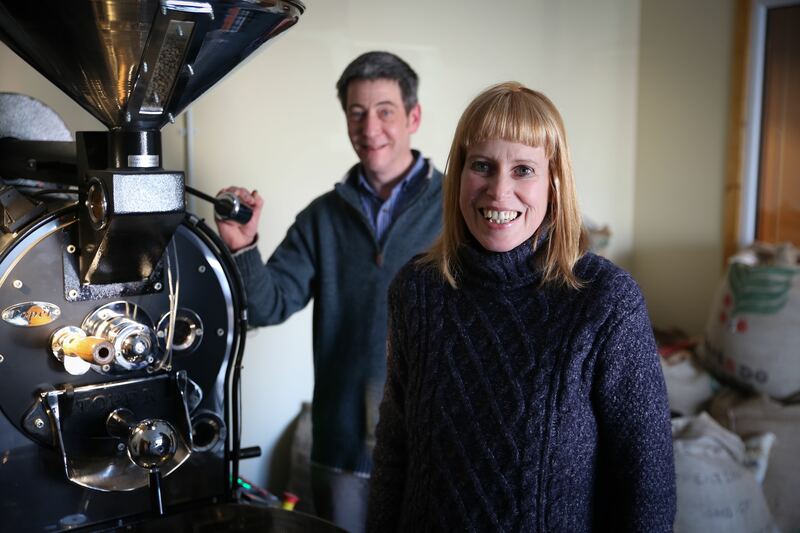 Sara and Euan are partners with Orkney business, training and advice consultancy, Sorton, but speciality coffee has long been a shared passion, one that planted the seed for this new enterprise. “Anyone who has tasted freshly roasted coffee, produced with real care for the beans and attention to detail in terms of the process, will know it’s a completely different experience from drinking, say, instant coffee from a jar,” explained Euan, a former operations director with the Edinburgh Tea and Coffee Company. “The downside is that it’s quite hard to get hold of genuine, freshly roasted coffee in Orkney, given our location and the occasional transport issues that presents. Euan Smith and Sara Tait. Pic: Fionn McArthur. The company commissioned a special 10kg gas roaster from Toper and have customised it over the last three months to achieve the exact control and recording capabilities to match their roasting processes. Euan explained the company will be offering whole bean coffee, for those who like to grind their own, along with cafetiere, filter and espresso grinds. Each roast being produced under the Aria brand has a musical theme – Aria was a coffee loving character in Johann Sebastian Bach’s comic opera, The Coffee Cantata – with, for example, the company’s Colombian coffee named Bolero, and its first espresso called Overture. Green coffee beans arriving at the Orkney Roastery are put through a rigorous traceability system before being sample roasted and ‘cupped’ to check flavour. “To get the best from a coffee we have to watch it right through its roasting cycle and be on hand to adjust the various settings to achieve the profile we’re after,” explained Euan. “There are so many variables – the moisture in the bean, the type of bean, even the wind direction outside, which can affect the airflow through the coffee bed. Your typical jar of coffee will be made via an industrial roasting process – it will be automated to achieve consistency and efficiency – but our manual process takes time and attention and it means you can get that bit more flavour out of the beans.